Will the Viper, Randy Orton stand tall at the end of the upcoming PPV? The second WWE PPV of 2019, Elimination Chamber is set to air in a few hours. After delivering a decent Royal Rumble PPV, WWE will be looking to continue the trend and produce another solid show. A total of 7 matches have been announced for the event. Major superstars like Universal Champion Brock Lesnar, Becky Lynch, Seth Rollins, Drew McIntyre, and Charlotte Flair are not scheduled to compete at the PPV. The matches announced for the event are - Nia Jax and Tamina vs. The Riott Squad (Liv Morgan and Sarah Logan) vs. Mandy Rose and Sonya Deville vs. The IIconics (Billie Kay and Peyton Royce) vs. Bayley and Sasha Banks vs. Naomi and Carmella are set to compete in first ever women's Tag team Elimination Chamber match for the inaugural WWE Women's Tag Team Championship. The Miz and Shane McMahon (c) vs. The Usos (Jey Uso and Jimmy Uso) are scheduled to fight for the WWE SmackDown Tag Team Championships. Buddy Murphy (c) vs. Akira Tozawa, Singles match for the WWE Cruiserweight Championship. Ronda Rousey (c) vs. Ruby Riott, Singles match for the WWE Raw Women's Championship. Bobby Lashley (c) and Lio Rush vs. Finn Bálor in a Handicap match for the WWE Intercontinental Championship. Braun Strowman vs. Baron Corbin in a no disqualification match. And the main event of the night, Daniel Bryan (c) vs. AJ Styles vs. Jeff Hardy vs. Randy Orton vs. Samoa Joe vs. Kofi Kingston an Elimination Chamber match for the WWE Championship. Even in the absence of a few top tier superstars, the match card looks decent and has the potential to deliver an engaging show. Potential chances of superstar interferences and unpredictable nature of few matches make this an intriguing show. Superstars like Drew McIntyre, Kurt Angle, Charlotte Flair, and Becky Lynch may make their presence felt during the course of the show through interferences in matches involving their arch-rivals. The first ever women's tag team elimination chamber match is set to determine the winners of inaugural Women's tag team winners this Sunday. Six teams are going to fight for the titles at the event. Coming to the winning chances of the teams involved, currently, it looks like only two teams are strong favourites to win the inaugural titles. 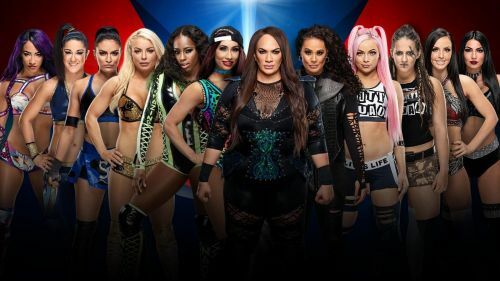 The teams of Nia Jax, Tamina and Sasha Banks, Bayley are considered as the strong favourites going into the bout. The team of Mandy Rose and Sonya Deville may be the dark horses in this match. Expect Sasha Banks and Bayley to win the Championships on Sunday by pinning either Billie Kay or Sarah Logan.